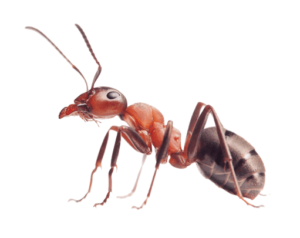 common names, including ginger ants, tropical Fire Ants, and red ants. Fire Ants can be distinguished from other ants by their copper brown head and body with a darker abdomen. A typical fire ant colony produces large mounds in open areas, and feeds mostly on young plants, seeds, and sometimes crickets. Fire Ants often attack small animals and can kill them. Unlike many other ants, which bite and then spray acid on the wound, Fire Ants bite only to get a grip and then sting (from the abdomen) and inject a toxic alkaloid venom called solenopsin, a compound from the class of piperidines. For humans, this is a painful sting, a sensation similar to what one feels when burned by fire—hence the name fire ant—and the after effects of the sting can be deadly to sensitive individuals. The venom is both insecticidal and antibiotic. Fire Ants nest in the soil, often near moist areas, such as river banks, pond shores, watered lawns and highway shoulder. Usually, the nest will not be visible, as it will be built under objects such as timber, logs, rocks, or bricks. If there is no cover for nesting, dome-shaped mounds will be constructed, but these are usually only found in open spaces, such as fields, parks and lawns.